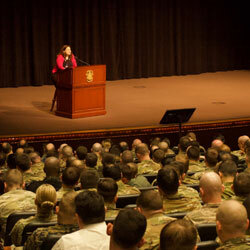 10th Annual Ethics Symposium focuses on LSCO | Command and General Staff College Foundation, Inc. 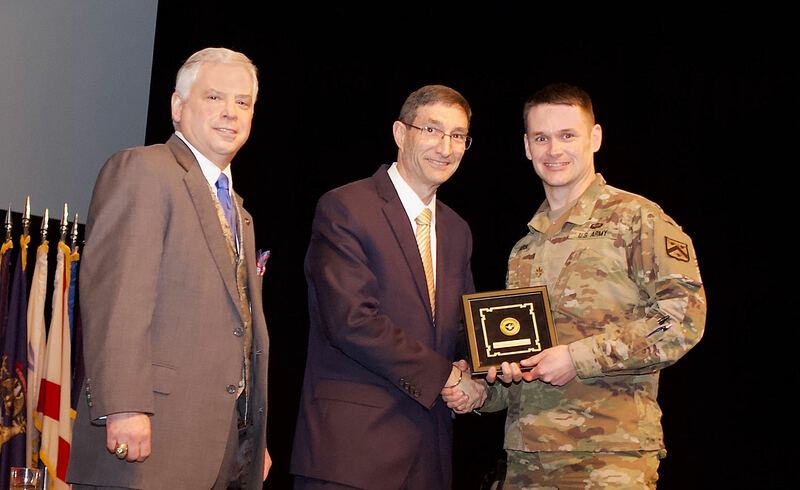 The U.S. Army Command and General Staff College conducted the 10th annual Fort Leavenworth Ethics Symposium on March 25 at the Lewis and Clark Center. 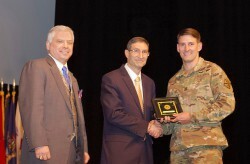 This year’s theme was “Ethical Implications of Large Scale Combat Operations.” According to the symposium organizers, the Army must begin the challenging process of thinking deeply and critically about the ethical implications and concerns of large scale combat operations (LSCO), which is the key focus of the Army’s operations manual FM 3-0, which was updated in December 2017. 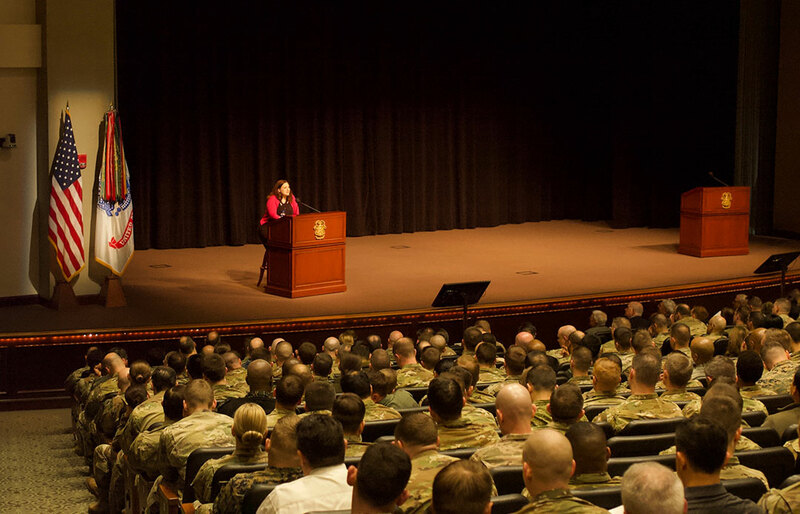 Dr. Shannon French, the Gen. Hugh Shelton Distinguished Visiting Chair of Ethics, kicks off the 2019 Ethics Symposium on March 25, 2019. CGSC student Maj. Chase Spears receives an award for his paper “Ethical Communication Approach for 21st Century Military Victory” from Dr. Ted Thomas, director of CGSC’s Department of Command and Leadership, and CGSC Foundation President/CEO Col. (Ret.) Roderick M. Cox. Mark Montesclaros, assistant professor in the Department of Joint Interagency and Multinational Operations at CGSC’s Fort Gordon Campus, receives an award for his paper “Plans from Hell: The Third Reich and the Eastern Front” at the 2019 Ethics Symposium. She noted many of today’s hot topics have roots in history. Today’s concern about autonomous killer robots is a reflection of the history of land mines, also autonomous killing machines, that goes back hundreds of years. Medically or mechanically enhanced human warriors, transhumanism, is another of today’s hot topics. Looking at history, Celtic warp spasmers, and many other warrior casts used chemical enhancement to add strength, lower sensitivity to pain, and decrease fear making them superior fighters on the battlefield. 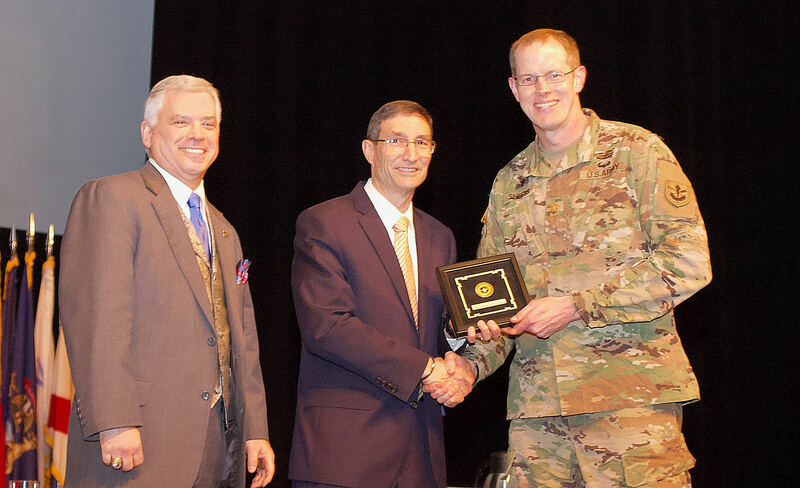 Finally, French challenged symposium attendees to “be part of the conservation!” – To that end, Dr. Ted Thomas, director of CGSC’s Department of Command and Leadership, along with Chaplain (Maj.) Jonathan Bailey, CGSC ethics instructor and the symposium coordinator, worked as part of a committee to select the best research papers submitted for the symposium. Two students and two non-students earned symposium awards sponsored by the CGSC Foundation for best papers in their categories. 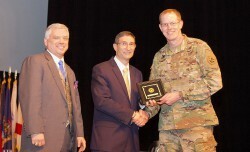 Foundation President/CEO Col. (Ret.) 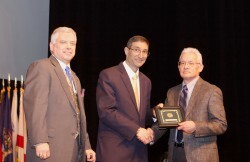 Roderick M. Cox and Dr. Thomas presented the awards in a short ceremony in Eisenhower Hall at the end of the symposium. 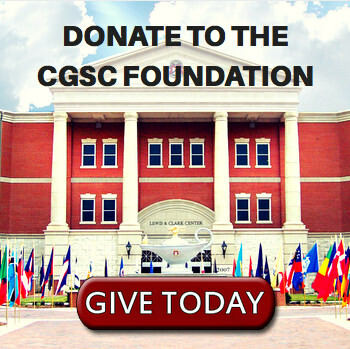 The CGSC Foundation will publish a selection of the papers submitted for the symposium in a “Special Report” this summer. The Foundation will also publish other papers suitable for the interagency audience in the Simons Center’s InterAgency Journal at a later date. 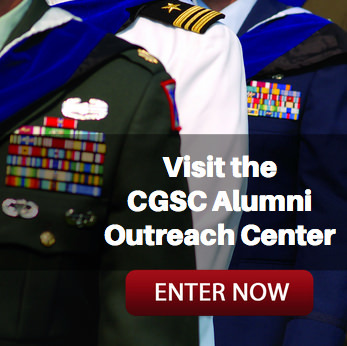 Visit the CGSC album on Flickr for additional photos.